Tour of Mick Lally Theatre led by architect Tom dePaor. A lecture on the design of the Picture Palace at Merchants road, Galway. Two of the six co-curators of Free Market, Orla Murphy And Jo Anne Butler, will give an informal talk about the exhibition currently representing Ireland at the 16th International Architecture Exhibition in Venice in 2018. This extension to a 1920s townhouse remakes the retaining wall edge bounding the Eglinton Canal, it’s stepped floor levels and folding roof-planes re-negotiate a relationship to the canal and city beyond. Designed by LiD Architecture, this extension to a 1920s townhouse remakes the retaining wall edge bounding the Eglinton Canal, it’s stepped floor levels and folding roof-planes re-negotiate a relationship to the canal and city beyond. Join us for a fun, hands-on introduction to the engineering, architecture & design involved in building Tower Houses. Designed by Coady Architects and built by Stewart Construction on a Design & Build basis, this award winning Gaelscoil was delivered through the ‘Rapid Build Schools’ programme for the Department of Education & Skills. 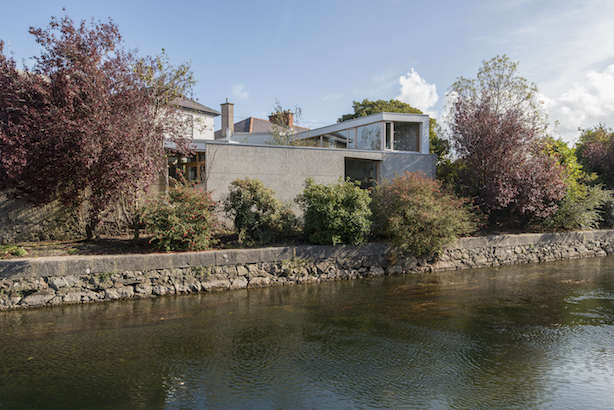 Architect Patrick McCabe led tour of Streedagh, a “modern movement” house with clean lines and bright interiors. The accommodation is arranged in an L-shape plan, embracing a courtyard garden to the rear. Date of Construction: 2018. Robbie Maguire MRIAI will discuss the design and delivery of this public amenity complex consisting of an 8 lane, 25m competition swimming pool with children’s learner pool, gymnasium, aerobics suite and annexed outdoor education building with climbing wall. One of the Galway Music Residency’s 2018/19 Apprentice Ensembles perform a programme of string quartet repertoire in the stunning surrounds of Clonfert Cathedral. FREE on a ‘first come’ basis. Rockfleet Castle also known as Carraigahowley, Carraig an Chabhlaigh, meaning ‘rock of the fleet’. Positioned centrally in the entrance to Clew Bay, Clare Island was once the stronghold of the O’Malleys who held most of the territory in the barony of Murrisk where they maintained strategically placed coastal castles including Clare Island Tower House. Noelle Angley FRIAI & Jackie Carroll MRIAI will give an introduction to the masterplanning, design development and co-ordination of their project in the Westport Town Hall, followed by a walk up to Tubberhill Social Housing and Westport Primary Care Centre. Exploration led by Dr Christy Cunniffe of the architecture and sculpture of this multi-phase church, burial place of St Brendan which has been a place of continuous worship for a millennium. Refurbishment, completed in 2018, of two storey stone cottage from the 1700’s. Architect led tours by Niamh Chambers and Declan Crowley of Studio Anois. Historian Fintan O’Gorman will guide a walk around the outside of the Ashford Castle building, including a guided tour of the estate gardens. Carrickkildavnet Castle,is a late medieval tower house built by the O’Malleys, which stands on the shore of Achill Sound. ‘STEAM’ - Science, Technology, Engineering, ART, Math.Join us for a fun, hands-on introduction to the engineering, architecture & design involved in building a sweet factory. Using a variety of simple materials the kids will design and build models of sweet factories inspired by Willy Wonka. Design workshop led by Engineer, Ryan Lavery, from Stewart Construction. Architect led tour by Niamh Kearns at 11am at Scoil na bhForbacha. N J Kearns & Co. Architects completed this 8-classroom primary school in Na Forbacha recently in August 2017. Simon Wall MRIAI, Municipal Districts Architect will give an illustrated talk on Westport’s holistic community approach to Town Planning and Heritage over the past two decades, in the town’s recently completed Town Hall Theatre overlooking the Octagon. Architect led tour, Risteard UaCroinin of the authentically restored 15th century Dysert O’Dea castle. Oranmore Castle was built in around the 15th Century as a stronghold of the Clanricardes who were a prominent Norman family of Galway. Artist Leonie Finn will guide visitors through the rich history of the castle, which was restored 1940’s and is now her family home. A screening of artists’ films that explore embedded narrative atmospheres of architecture and the built environment. Ardamullivan Castle was built circa the 16th Century; restored in the 1990s to protect the late medieval wall paintings discovered on the first and fourth levels. This is a rare opportunity to visit. Join us for a yoga session where we will use stretches, poses and meditation to explore the architecture of our own bodies and the spaces we inhabit. Participants will be guided through a sequence of gentle chest-opening stretches and spine exercises before exploring curved architectural forms and structural strength within the body. Instructor: Paul Hardiman, An Seomra Yoga. Open to ALL LEVELS - mats will be provided.